The pork industry has been back in the national headlines over the last couple of months. 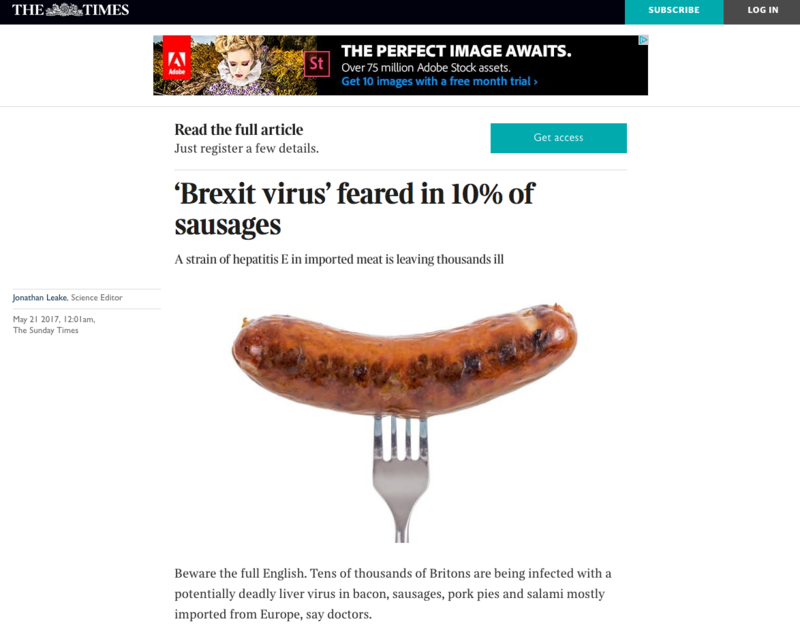 “‘Brexit virus’ feared in 10% of sausages”, ran the headline in the Sunday Times in May, above an article warning that ‘a new strain of Hepatitis E in imported meat is leaving thousands ill’. * 93% of British pigs are infected with HEV, with 6% producing enough virus to infect humans. And just this week, the European Food Safety Authority (EFSA), said that the most common cause of Hepatitis E infection across the EU was due to consumption of under-cooked pork. Most of these claims had already appeared at some point in the media, including in articles dating back to 2014. But the story was given added impetus by comments made by Dr Harry Dalton, a gastroenterologist at Exeter University, at a conference on neurological diseases. Suggesting HEV had become a major threat, he said: “I call it the Brexit virus. It attacks the liver and nerves. He said nobody should eat ‘pink’ pork and advised pregnant women and transplant patients not to eat pork at all. So how do these claims stack up? And how concerned should the industry be after this latest bout of publicity, albeit with a strong focus on imported pork? Hepatitis E is an illness of the liver caused by Hepatitis E virus (HEV), which can infect animals and humans and is found worldwide. There are four types of HEV, known as G1 to G4. According to Public Health England (PHE) and the Food Standards Agency (FSA), HEV infection usually produces a mild disease. However, symptoms can vary from nothing to liver failure. In rare cases it can prove fatal, particularly in pregnant women. 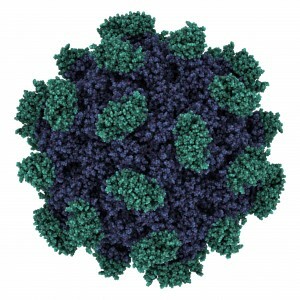 Normally the virus infection will clear by itself within one to four weeks but it can persist in individuals with suppressed immune systems, causing chronic inflammation of the liver. Are cases rising in Britain? The latest official figures from PHE showed there were 1,244 laboratory confirmed and officially reported cases of HEV in the UK in 2016, a similar level to 2015. The number has risen steadily since 2010 when the official figure was 368, although cases were down significantly in the first quarter of 2017. While these are by no means all ‘serious’ or ‘severe’ cases, as suggested in the reports, a PHE report noted that the number of recorded HEV cases tripled from 2010 to 2015 ‘with a trend towards more severe and prolonged illness’. The widely reported ‘tens of thousands’ figure dates back to modelling some years ago to reflect the number of cases that weren’t officially detected – a PHE paper from 2014 put the figure at 60,000. In a 2016 paper from a joint FSA/European Food Safety Authority (EFSA) workshop on foodborne viruses, Dr Dalton said the incidence of HEV infection was ‘much higher than previously thought’ and put the figure at ‘more than 100,000 infections’ in England each year. But the key point here is that most infections are ‘asymptomatic or unrecognised’ – and therefore unlikely to cause health problems. Why is infection linked to eating pork? Pigs are a natural reservoir for HEV. Infection involves the virus being present in the blood with temporary spread into muscle and other tissues. It persists for longer in the liver than in other tissues. Until recently, human infections in the UK were generally associated with travel to countries where the virus was spread by infected food or water contaminated by sewage. But today, the majority of cases in England and Wales, 69% in 2013, are not travel-related. subgroup 2, if people are getting it from eating pork, it is unlikely to be British, analysis shows. * The UK pig viral samples mainly belonged to HEV G3 subgroup 1, with only one pig carrying the G3 subgroup 2 version, associated with most UK human infection. While there is no evidence subgroup 2 is circulating widely in the UK, pigs in the US, Asia and Europe are known to carry it. Has HEV been found in retail meat? It is often quoted that one in 10 sausages in the UK could potentially be infected with HEV, but the science around this is very uncertain. In 2012, an Animal and Plant Health Agency (APHA) survey found that 2.5% of pig livers and 10% of sausages were contaminated with HEV. However, the FSA has cautioned that these findings ‘need to be interpreted with caution’ as the sample size was small – 63 sausages from 11 batches – and ‘not representative of the UK market’. While six sausages tested positive for HEV, five of these were from the same batch. The origin of that pork was also unknown. Detection rates of between 4% and 22% for pork liver sausages in Spain, UK, France and Germany were reported by the FSA/EFSA workshop. 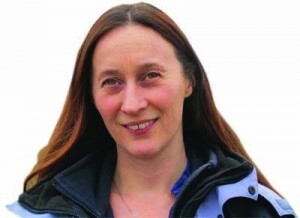 But highlighting the current lack of effective diagnostic tools, the FSA said there was an ‘urgent need’ to develop a test for whether HEV detected in foods is infectious and likely to cause illness. Following last month’s media reports, the FSA and PHE reiterated their advice to consumers that the risk of acquiring Hepatitis E virus (HEV) from eating thoroughly cooked pork or pork products is low. The National Pig Association (NPA) added that sausages produced under the Red Tractor logo are not permitted to include liver or offal, reducing the risk of contamination compared with countries where liver and blood sausages are popular. How damaging is the situation for the UK pig industry? While HEV does not appear to pose any serious threat to human or pig health, the increasing volume and tone of media coverage could prove harmful, said NPA chief executive Zoe Davies. The biggest danger is to the export market. In 2014, the UK temporarily lost the Chinese trade following a similar story that appeared on the BBC website. “Government officials and key industry players had to make an emergency mission to China to prevent the story having a major, and entirely unjustified, impact on that vital market,” Dr Davies said. The NPA has published a briefing and issued a media statement setting out current knowledge on the link between HEV and pork, including the official view that, if infection has come from pork, it is likely to have been imported. “We will continue to try and ensure the media and the public understand the full story,” Dr Davies said.